You may give to this movement in many ways. Cash and check gifts may be given to the church office or placed in the designated dropbox in the church lobby. Account Name: Christian Bible Church of the Phils. Email copy of deposit slip / transaction details to [email protected] for confirmation. Paypal account holders can donate directly from Paypal by sending funds to [email protected] Credit card holders can click the Donate button below to give online via credit card. You’ll be directed to Paypal’s website to complete this transaction. Major credit cards are accepted. Note: Paypal will deduct its standard fee from the donation (3.9% fee for domestic funds, 4.4% fee for international funds). CBCP will supply some of the materials and equipment for the building project to manage costs. 2018 Jan 29. 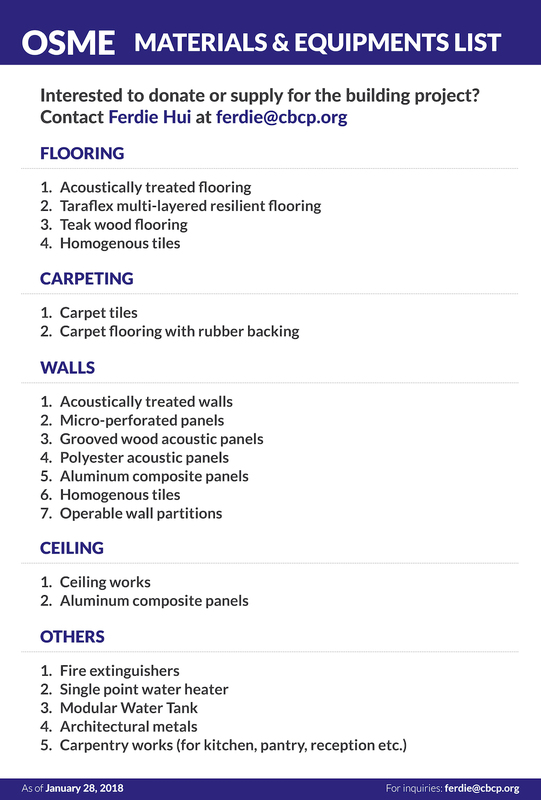 The CBCP Construction Committee has released an updated OSME Materials and Equipment List, covering Flooring, Carpeting, Walls, Ceiling, and Other items. 2017 Jun 14. 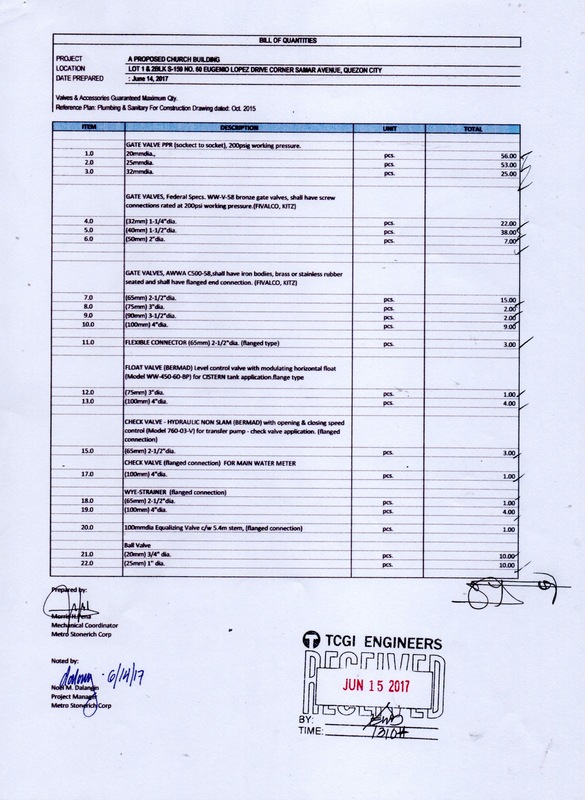 The CBCP Construction Committee has released a detailed Valves and Accessories Maximum Bill of Quantities (BOQ) for the Plumbing and Sanitary system. 2016 Nov 13. The CBCP Construction Committee has released a detailed list of time-sensitive requirements for Owner Supplied Materials (OSM), which you can download in PDF form. 2016 August. You can download a detailed list of the Owner-Supplied-and-Installed (OSI) and Owner-Supplied-and-Contractor-Installed (OSCI) materials needed.